I have been meaning to make some of these lounge pants from Amy Butler's 'In Stitches' ever since I got the book (about a year ago), and have been saving thrifted sheets for the very purpose. I have to say they are the comfiest 'soft bottoms' I have had for a very long time, and I am practically living in them at the moment! 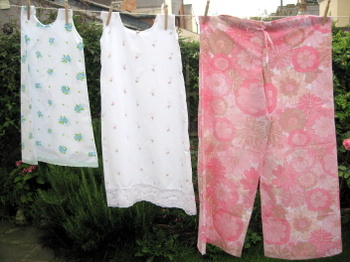 I had to make 2 pairs as one was a trial with a not-so-nice sheet, and the white ones are my ones for 'best'. Unfortunately as always happens, the trial pair came out slightly better than the 'best' pair, but they are both comfy and pretty, so who cares?! 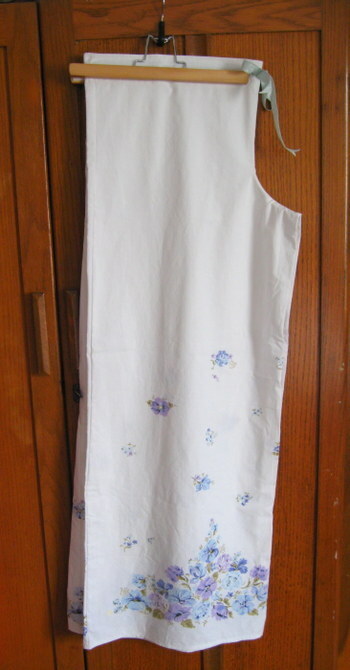 I also made the girls a nightdress each. 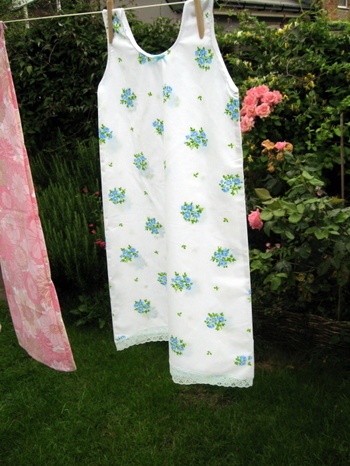 Grace is obsessed by nighties and has several - some of which I've made and some from Boden, and I have to say that the ones I have made myself have lasted longer and washed better, so from now on I am sticking to making my own. Ruth demanded one when she saw I was making one for Grace, despite normally having to be swaddled from head to toe at bedtime (including socks) even in the hottest weather. I made her promise she would wear it if I made her one, and to her credit she has rarely been out of it. It is now lunchtime and she is still in it, so it was a hit and I may make her some more. 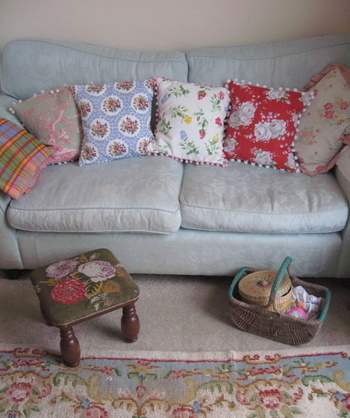 Aside from nightwear I also made three cushions (the three in the middle) for the sofa (long overdue), 2 cushions for my outdoor chairs (if we ever get to use them again - they are a bit soggy at the moment) and an ironing board cover, which was a necessity as I cut through the existing one whilst making one of the cushions. 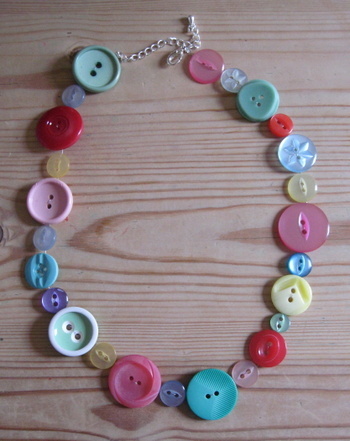 I've even dusted off my jewellery making stuff and made these two necklaces. My lovely little sister has just bought her first house with her boyfriend and the girls and I are going to stay with them on Friday for almost a week, so I had to make her a few house-warming presents to take along too. Unfortunately I can't show you at the moment in case she reads this, but I'll post a photo when we return. 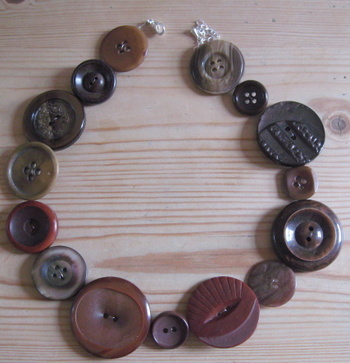 All in all I have been a very busy bee, and I have loved feeling that creativity return. As they say, every cloud has a silver lining. I'll have to injure myself again soon so that I can stay in and sew more often! We are loving the holidays and don't want them to end. It's so nice catching up with friends and floating around in PJs until lunchtime. I may not be around much for the next couple of weeks - I'm away with the girls and then we are (weather permitting) going camping for the last week of the hols, so apologies if I am not a frequent blog visitor for a while. Normal (ie erratic) service will resume once term starts! I think I may be turning into Barbara Good, despite being about 2' taller and not looking good in denim dungarees. For those of you who don't know, there was a fab classic '70s sitcom about a couple who turned their suburban garden into a small-holding much to their neighbours distress, called 'The Good Life'. 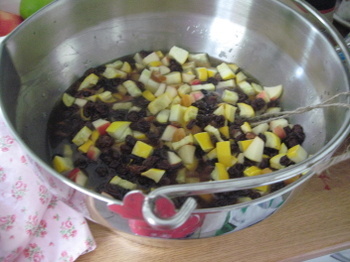 I have been making jam, pickles and chutneys and the house smells of a peculiar (but not unpleasant) mixture of fruit and sugar, vegetables and vinegar. 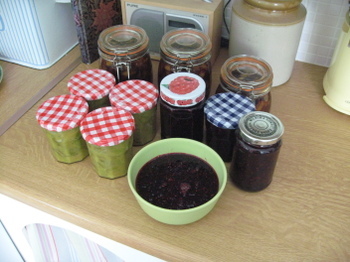 We have got so much produce at the allotment at the moment that preserving it is the only way of keeping on top of it. My freezer is full to bursting and I love the thought that in the Winter we can eat things that were frozen in the Summer. A very kindly neighbour gave us a huge bag full of beetroot so I made Roasted Beetroot Soup from Sarah Raven's lovely book, accompanied by Courgette Bread (which was delish), and still had enough beetroot left over to pickle several jars-worth. I have made Courgette Chutney, Blackberry Jam (with a hint of Raspberry - not enough yet to make it in it's own right), Runner Bean Pickle and am heading back down to the plot today to see what else is on offer. It is a full time job at the moment trying to eat it all! I am aiming to make Sarah Raven's Runner Bean Flower Salad, which has the beans and the flowers in together. I'll let you know how it goes! Courgette Chutney. Note the yellow courgettes - we have hundreds. The green ones are not doing as well and I have only had 1 tiny one from them so far. 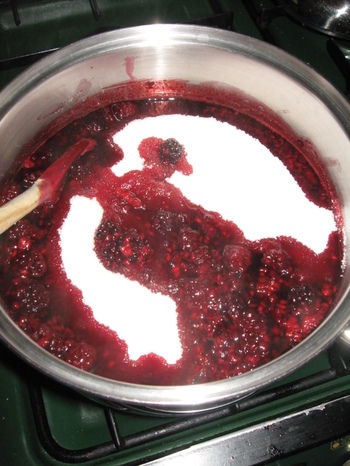 I love the way the blackberry juices melt into the sugar - my favourite part of jam-making. A small portion of yesterday's preserving. I ran out of jars and had to send Andy out for more Le Parfait ones, but the jam in the bowl is destined for a cake! I have been reading my absolute favourite book again - 'The Magic Apple Tree' by Susan Hill. I am on my second copy as the first fell to bits through over-use. I think I may have mentioned it before, but I love to read it at the start of each season (and during) and it makes me want to live in the countryside even more every time I read it. It really evokes an image of unspoilt English countryside, which I'm sure isn't really the case in many villages now, but all the same it is a good read and a good prompt for daydreaming! While the girls were away last week being spoiled rotten by my parents I turned the basement into a den/playroom. They have so many toys that are shared jointly and get really mad with each other if they leave their rooms in a mess that I thought it was time they had a place to share them. I won't need it as a workroom anymore (although I am hoping that now my stuff is in the dining room I will use it more frequently), and they were thrilled. It took me 3 days, 6 bags of stuff for the charity shop, 4 bags of rubbish and a sore back from carrying all the playmobil and Sylvanian Families stuff downstairs, but it was worth it. When asked what they would like to do (Andy is off work too so days out are a real option) they have said they want to stay in to play in the 'den'. I've hardly seen them, which is how I have managed to get so much preserving done! I spent a very happy hour setting up all the Sylvanian Families bits and pieces, and the Playmobil Victorian House, and actually got quite cross when they decided to move all the furniture round! 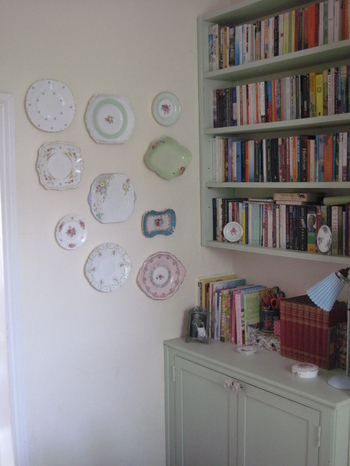 In between all the cooking I did find time to put up some plates in the dining room. I have been meaning to do it for ages, and I am really pleased to create some space in my cupboard and also be able to look at these beauties more often. I ran out of plate holders and I have got one more plate to go up (which is why it is a little wonky at the bottom), so will have to get on to that today. Aside from that, if we can tear the children away from the basement we will be weeding and harvesting, visiting the Holst Museum and walking Bodie. Sophie gets back from nearly a month away on Monday and we need to tart up her side of the allotment a bit as we promised we would look after it for her and haven't done much other than feed her tomato plants so far. We won tickets to Longleat at the school fair and are hoping to go tomorrow if the weather is ok. If not, then the den it is!! I hope you are all enjoying the holidays despite the weather. Have fun!